An exercise ball workout is a great break from the traditional workouts with weight machines and dumbbells. Take a look at some of the benefits you will receive from this fabulous and non-traditional way to exercise. - An exercise ball workout incorporates the added challenge of balance while you are doing a workout such as balancing on one foot while stretching your hamstrings shown here in this Pilates core ball workout. – Each exercise you do in your exercise ball core workout incorporates having to stabilize the core before you can begin to work the extremities like your arms or legs. For instance, if you are trying to perform a push up using the exercise ball as you walk out into position you need to make sure the abdominals are engaged or you will roll right off the ball. Another exercise is a ball squat where you position the ball on the wall leaning into it at your lower back. Bending your knees lower yourself to a sitting position letting the ball roll up your spine. Again, if your abdominals are not working you will fall off the side of the ball. – The dynamic nature of these exercise ball routines allows you to progressively increase or decrease the intensity of the exercises by making slight adjustments in your body position. For instance, with the Pilates ball pushup, the farther you walk out bringing more of your upper body off the ball the harder your upper body will have to work to push you up. The more of your body weight that is supported on the ball the easier it will be to push yourself up. - For many abdominal exercises the workout on the exercise ball allows for a greater range of motion, which helps to increase your flexibility and strength in the muscles. An abdominal extension where you roll your spine back over the ball is a greater range than you would achieve on a flat surface. - The rolling aspect of the ball allows you to roll into positions with ease and a more challenging transition to another exercise. For instance when doing a Pilates ball video workout you can transition from an exercise ball side stretch or oblique lift right into kneeling side kicks on top of the ball working the abductors of the thighs. - When doing any exercise ball routines, the dynamic transitions allow for more focused and deep abdominal breathing techniques. 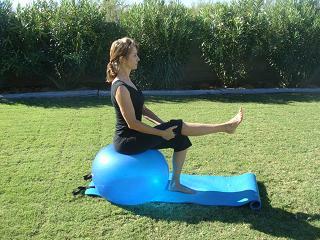 – The big round ball adds an element of play to your exercise ball workout routine. Fun is incomparable to all the others when working out because no matter how good it is for you, if you are not having fun you won’t be motivated for exercise. Shown below is me rolling with exercise ball. What could be more fun? – The exercise ball workout can be done anywhere. At home, when you travel, at the in-laws, in the yard. All you need is a small amount of floor space and a ball. Most of the balls can be deflated and easily filled up with a foot or hand pump so you can pack them along anywhere you go. 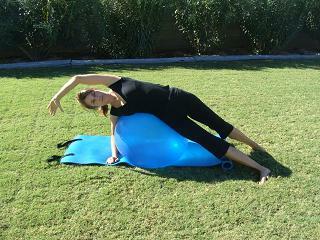 Check out the just released 35 Minute Core Exercise Ball Workout Challenge available here.